New at Bullyan RV, we are proud to present the Grand Design Reflection 150 fifth wheel for sale here at Bullyan RV! 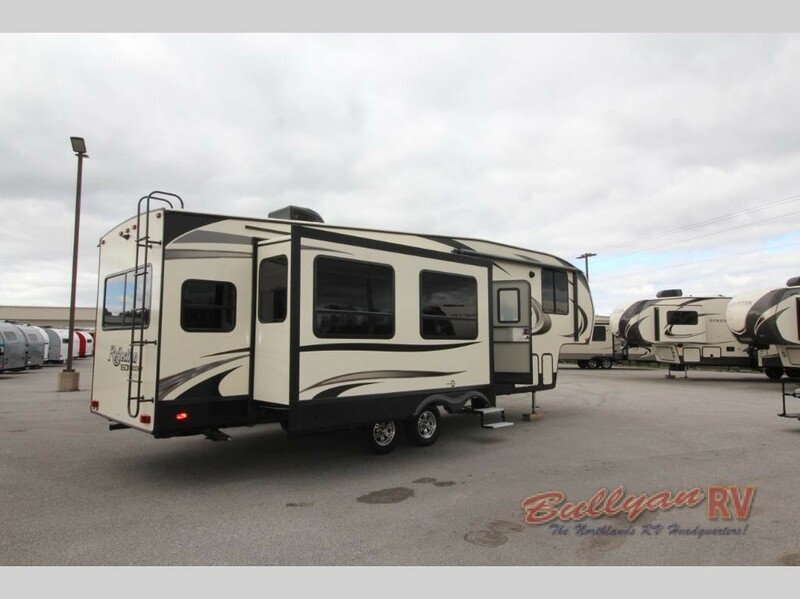 A spacious fifth wheel with a lot to offer, our new 295RL floorplan comes with all of the features that you have come to expect in a luxury 5th wheel. If you want to know what makes this new floorplan really something special, you have come to the right place! Find out about some of our favorite features in our Grand Design Reflection 150 fifth wheel review! The Grand Design Reflection 5th wheel comes with awesome interior amenities that we find particularly comfortable. This includes solid hardwood cabinetry with ball-bearing drawer glides so that you can pull them in and out with no trouble. These kinds of small comforts can really make your road trip carefree by making day-to-day life that much easier. This on top of the reclining living room chairs with cup-holders and end-tables ready for your favorite drinks and snacks makes this 5th wheel a dream come true. Check out the versatility of the Grand Design Reflection Fifth Wheel Interior. The front bedroom of the Grand Design Reflection 150 fifth wheel has got everything that you need to relax in style; from corner night stands to king-sized wardrobe availability and plenty of overhead storage, this bedroom is meant to make you really cut loose and relax no matter where the road may take you. This plus the sizable window makes it easy for you to enjoy the great outdoors even when you are laying in bed. 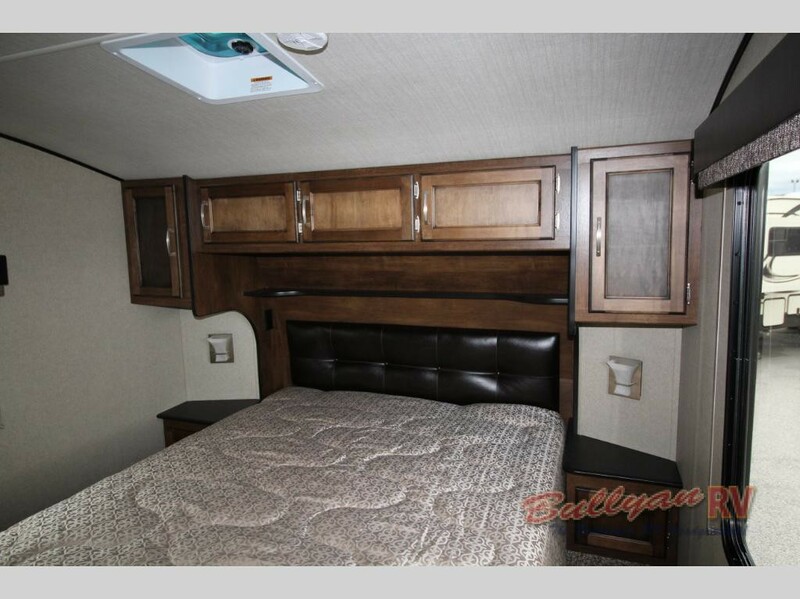 Plenty of comfort in the Grand Design Reflection Fifth Wheel Bedroom. We’ve picked a just a few excellent features in our Grand Design Reflection fifth wheel review, but there are so many more for you to get excited about! 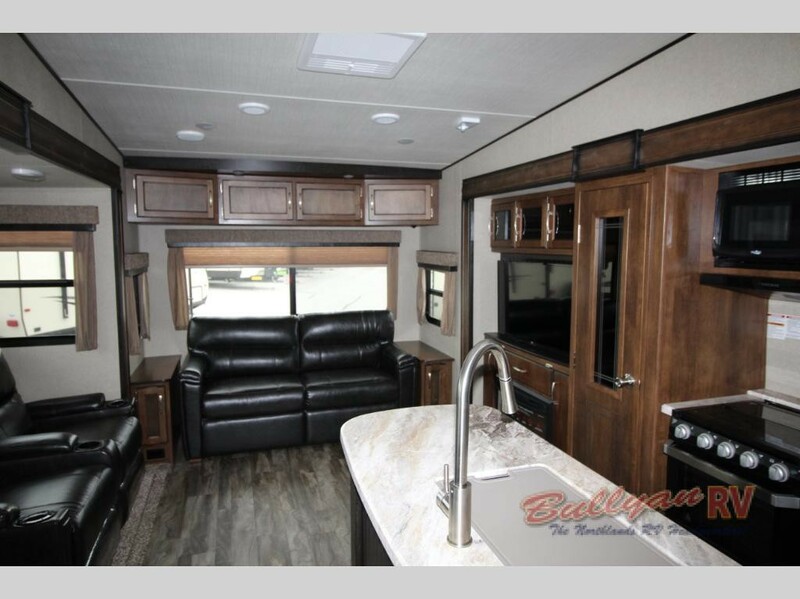 This Grand Design Reflection 150 fifth wheel 295RL floorplan is brand new here at Bullyan and has plenty to offer, but you can also check out some of our other Grand Design Reflection floorplans to compare the 295RL with some of the other great models. No matter what 5th wheel you choose, you can bet you are going to get a great deal on a quality vehicle here at Bullyan RV! Contact us to get more information today.